Learn from 18 professional West Coast Swing dance instructors, all on the same 2 hour DVD. 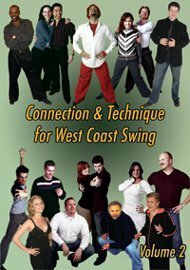 This DVD covers 24 different topics about connection technique, dance technique, and fundamentals for West Coast Swing. Champion instructors include Stephanie Batista, Skippy Blair, Chuck Brown, Tessa Cunningham, ChristoFUnk DeMaci, Jesse Dickson, Edwin Li, Rich Lundin, Jennifer Lyons, Jim Minty, Ben Morris, Myles Munroe, Melina Ramirez, Terry Roseborough, Libbat Shaham, and Doug Silton.